When I was a kid, there were a few important rules in my house. One of them was not to throw or kick balls inside the house. While it might have bothered my brother and I on rainy days, it was a rule that made a lot of sense. There were many more things to break inside the house, than outside. But what if you’re brave enough to encourage your kid to play sports inside? You’ll need the right furniture to accommodate them. 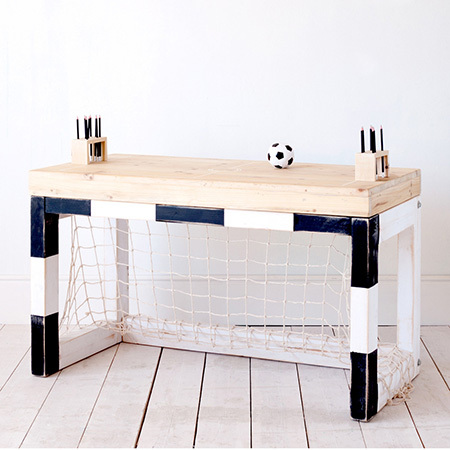 The JAN Table was designed to look and function as a soccer (or football, if you’re from anywhere but the US) goal. Sure, it’s not exactly regulation size, but that would be a little hard to eat off of. It sits at two and a half feet high, and a little over four feet long, which is plenty of room to have a little bit of target practice with a ball. The tables are all hand-made using entirely reclaimed wood, natural products, and eco-friendly processes. The tables come in two different color schemes. Both have a natural wood color on top, but one has a black and white goal, while the other is red and white. Each will set you back around $850, though you may want to set aside a little extra money to cover the broken items that you’ll find in the room at some point.